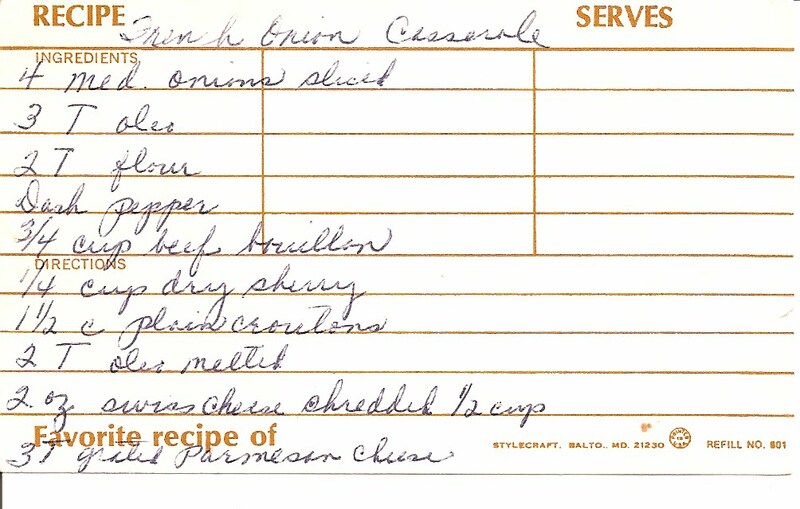 This recipe is an interesting rearrangement of French Onion Soup. If and when I try to make it, I'll post some photos. - Cook onions in the 3 TB oleo/butter until tender. - Mix in flour and pepper. - Add bouillon and sherry, and cook until thickened and bubbly. - Pour into 1 qt casserole dish. - Toss croutons with 2 TB oleo / butter and put on top of onion mixture. - Sprinkle with swiss and parmesan cheese. - Place under broiler until cheese melts, about 1 minute.